The Volkswagen Tiguan Allspace seven-seater is priced from £29,370 in the UK - £6745 more than the closely related Skoda Kodiaq and £6645 more than the Nissan X-Trail. The Volkswagen's range begins with a higher power output than Skoda's, however. At £30,970, the 148bhp Tiguan Allspace DSG is £3760 more than the equivalent seven-seat Kodiaq, which is priced from £27,210 and available only with a DSG gearbox. The Tiguan Allspace range tops out at £39,965 for the 237bhp 2.0-litre diesel model with four-wheel drive and a DSG automatic gearbox in SEL trim. Unlike the Kodiaq, the Tiguan Allspace gets seven seats as standard. It also provides sat-nav, an 8.0in infotainment system and driver assistance systems such as adaptive cruise control, automatic emergency braking and lane-keeping assist. Two specs will be available at launch: SE Nav and SEL, with R-Line to be available from the end of April. Volkswagen UK expects the most popular set-up to be SE Nav trim with the 2.0 TDI 150 engine, a six-speed manual gearbox and 4Motion four-wheel drive. The Tiguan Allspace's engine line-up comprises three petrol and three diesel engines, ranging in output from 148bhp to 236bhp. A 148bhp turbocharged 1.4-litre petrol unit kicks off proceedings. It features Active Cylinder Management, allowing it to return 47mpg on the combined European test cycle for average CO2 emissions of 135g/km. It's accompanied by a turbocharged 2.0-litre petrol engine with either 177bhp or 216bhp. On the diesel side, Volkswagen’s widely used turbocharged 2.0-litre engine is available with 148bhp, 178bhp or 236bhp. All three diesels are equipped with a 12-litre Adblue tank to reduce NOx emissions. The 148bhp 1.4 TSI and 148bhp 2.0 TDI are both sold as standard with front-wheel drive, although the latter can be specified with Volkswagen’s 4Motion four-wheel drive system, which comes as standard on all other variants. 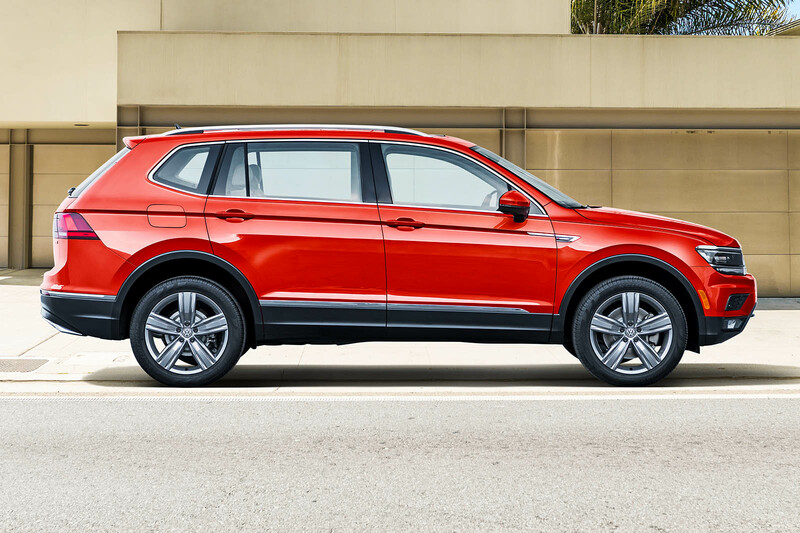 The Tiguan Allspace is a stretched variant of the Tiguan mid-sized SUV; 215mm has been added to the overall length, including 110mm added to the wheelbase, allowing the interior to accommodate an extra row of two seats or an additional 115 litres of boot space. This puts the total boot space of the Tiguan Allspace at 730 litres with the rearmost seats folded flat, or 1770 litres with only the front two seats unfolded; 180 litres up on the X-Trail with the third row folded, but 212 litres down with both rear sets of seats flat. For comparison, the Tiguan Allspace is also 50 litres up and 295 litres down on the Kodiaq in those regards. On the outside, the car is largely similar to the standard Tiguan, with only minor revisions to the bonnet and front grille. The profile is also slightly altered due to the extra length. We’ve already driven the Tiguan Allspace in prototype form, and found the two rearmost seats to be only practical for small children; even two small adults would struggle to sit side by side in the third row. Everywhere else, the model mirrors the standard Tiguan in its uninspiring but surefooted drive and solid, plush-feeling interior. The treatment of the front of this car. combined with the dumpy looking rear, literally make this car look like it is drooping at either end. On one hand, VW will probably argue that they have made the car look 'substantial', on the other, I'd argue it just looks joyless. The front looks so broad with the grill chrome adding to the width (perception?). The rear really looks dull. The rear lights are droopy joyless additions. A missed opportunity to give the car a lively exciting look. Sombre. Is it me, or was the Tiguan supposed to be the 5 seater "compact" SUV? Now it sports 7 seats and is bigger than ever! agree looks boring they all look the same front and back and side.